A new cruise line has formed to serve the ever crowded British Market. Cruise & Maritime Voyages will sail exclusive for British guests along the style of Fred.Olsen, Saga, and Voyages of Discovery. These lines cater to a more mature market, think Holland America. Cruise & Maritime Services International is the group starting the venture. Their approach to operations is by chartering two vessels. One is the Marco Polo of Transocean Tours. You may remember her from the recent H1N1 outbreak. 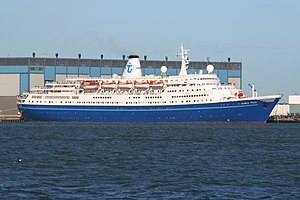 The Marco Polo is currently chartered by Transocean Tours from Marco Polo Chartering Company. The director of Cruise & Maritime Voyages stated that they have the ship for 5 years after the Transocean Tours charter runs out. The other ship is the Ocean Countess (EX. Cunard Countess, Awani Dream II, Olympic Countess, Ruby). Cruise & Maritime Voyages chartered the ship for 2 years from Majestic International Cruises Group in Greece. Departures for both ships are said to be from Hull, Newcastle, Edinburgh, Greenock, Liverpool and Plymouth, England. The destinations are the normal Europe (North/British Isles/ Mediterranean) and the Canary Islands. No word on a North American voyages. The voyages are to commence summer 2010. I am thinking of a cruise on Ocean Countess (from Leith) and have been trying to get actual customer feedback. Personally I prefer getting my meals from a buffet type set up is this possible? Have also heard concerns regarding inter cabin soundproofing , is this a real issue? I haven’t heard about any sound proofing woes, but there is a buffet style restaurant called the Boat House.